In the year 2018, the value of exported goods from Iceland amounted to ISK 602,200 million fob and the value of imported goods amounted to ISK 776,600 million fob (ISK 828,300 million cif). Thus there was a trade deficit, calculated on fob value, of ISK 174,400 million as compared with a trade deficit of ISK 176,500 million in 2017, at current rates of exchange.1 The deficit of balance of trade in goods was ISK 159,300 million excluding ships and aircraft, compared with ISK 161,700 million in 2017. The total value of exports of goods in 2018 was ISK 82,500 million higher (15.9%) than in the year before at current rates of exchange. Exported manufacturing products contributed 53.3% of total exported goods and their value was 14.7% higher than in last year. The value increase between years can be linked to aluminum export but relative increase was highest in the group other industrial products. Marine products contributed 39.8% of the total exports and their value was 21.7% higher than in the same period the year before. The increase in marine product exports can partly be linked to a fisherman strike in early 2017. The total value of imports of goods in 2018 was ISK 80,500 million higher (11.6%) than the year before, at current rates of exchange, mainly because of increased imports of fuels and processed industrial supplies. Million ISK at current exchange rate Change on prev. ¹Statistics Iceland does no longer publish trade in goods at constant exchange rates. The breakdown of trade in goods by currencies is available on Statistics Iceland’s website. 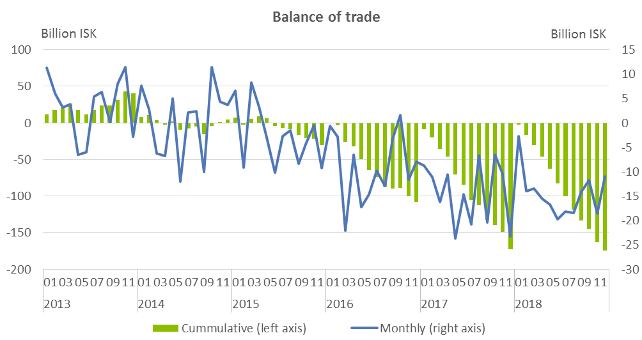 Monthly figures of external trade for current year are revised together with the release of figures for new months. Annual figures are published in the first half of the year after the end of the reference year. The figures are considered as final at that point of time.